The sampling in Alameda has occurred with permission from the Alameda Point Collaborative (APC). The APC garden and plant nursery have served as educational sites and the results are communicated back to the community partner. The sampling methodology has been the same as reported for the Oakland residential site. The Oakland residential site screening experiment was written up as a formal lab experiment and published by the Journal of Chemical Education 2008, 85(7), 980-982. Coins with known elemental composition are useful. The US Mint reports the elementar composition and coins are readily available. US Pennies are probably the easiest to use. 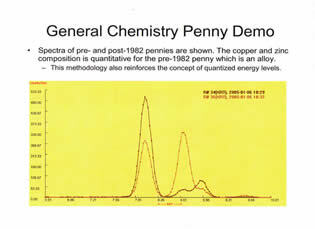 In 1982, the penny's composition was changed from an alloy (95 % Cu and 5 % Zn) to a copper plated zinc coin. The adjacent image shows the pre-1982 coin in dark brown and the post-1982 coin in light brown. The peak intensities are quantitative for the pre-1982 coins. The peak intensities are not quantitative for the post-1982 which highlights the surface sensitivity of this instrumental methodology. 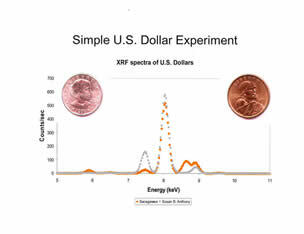 The two US dollars have distinctive XRF spectra. The Susan B. Anthony dollars are composed of two elements and the Sacagawea dollars are composed of four elements. Viewing the two spectra , one can quickly ascertain the elements that are the major components. Students can be directed to use the Lawrence Berkeley Lab XRF periodic table to determine the elements in the two US dollar coins. In Fall 2006, students applied their field sampling skills from the highway site characterization to double check on a site where a lead in soils removal action had occurred in Alameda.